Woloshen is a Montrea-based camera-less animator who has been making films since the late ‘70’s. He studied film at Concordia, where he initially made documentaries and collage films, but the freedom and accessibility of scratch animation won him over. Since 1999 he has worked exclusively in 35mm CinemaScope, an oddity in the independent film world that is made possible by his otherwise thrifty means of production. 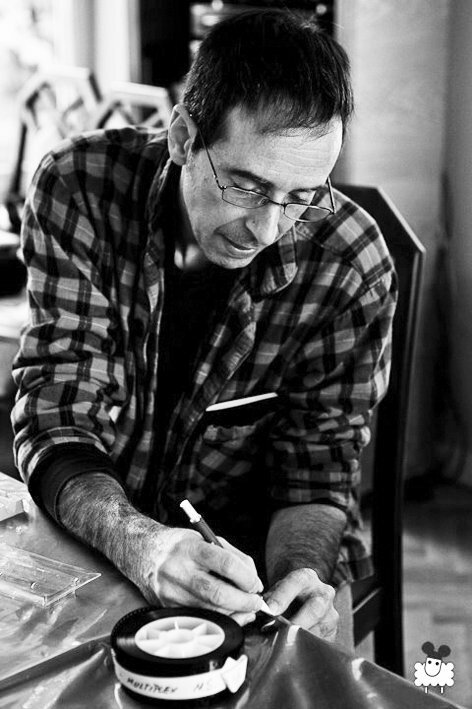 His works have screened worldwide at festivals including the Montreal World Film Festival, Tampere International Short Film Festival, Annecy Animated Film Festival, Ottawa International Animation Festival, and I Castelli Animati in Rome. Woloshen is heavily inspired by music, particularly jazz, and has made numerous short abstract works in which the images are created in synchronization to a music track. While most of his films are exuberantly colored, MeMeMaMa (2000) is done in spare black and white. White scratches resembling rubbings, chalk drawings or electronic static jitter across a black background, matched to the driving beat of a techno music piece. (2002) takes a piece by Erik Satie and translates it into abstract imagery. The deep, masculine sound of a tuba appears in blocky shapes of colour, contrasted with delicate white squiggles corresponding to a woman singing. The tuba and voice play off each other as if in conversation, male and female. Dave Brubeck’s jazz classic “Take Five” is the inspiration for Cameras Take Five (2002), in which fluid lines represent the saxophone voice, moving over top of color fields of electric blue and green interspersed with playful shapes and doodles. These are vibrant, light-hearted works, which capture the spirit and energy of the music. As in jazz, improvisation and chance are important aspects of Woloshen’s work. Because his films are self-funded and the tools of his craft (film leader, markers, inks, brushes and craft knives) are readily available, he can seize on an inspiration and act on it immediately. He writes: “I think spontaneous urges and desires are the best part of handmade film making.” Woloshen even constructed a portable scratch box so that he could do scratch animation during breaks on his job as a driver in the feature film industry. As fun as Woloshen’s musical salutes are, for me the strongest and most satisfying of his films are those which depart somewhat from this method, such as The Babble on Palms (2001) and Two Eastern Hair Lines (2004). The Babble on Palms features various found-footage scenes of everyday life, accompanied by music by Ali Akbar Khan. The outline of a hand appears over all of the scenes, partially blocking our view. The hand is treated with constantly changing decoration such as dots and spirals, and patterns and colours reminiscent of both the solar system and cells under a microscope – the universe is contained in our hand. The film suggests a thread connecting all people, but also the limitations of our viewpoint and the individuality (the “hand print”) that sets us apart. Since his return to filmmaking in 1996, after a hiatus of more than a decade spent working in various capacities in the film industry, Steven Woloshen has been extraordinarily productive, seemingly increasing his output year by year even as he faces the usual obstacles that tend to slow an independent filmmaker’s career (parenthood, the need to earn a living, lack of financing). It’s clear that the years he spent working on film sets and in labs were far from wasted: Woloshen’s work “post-hiatus” is extraordinarily assured compared to his promising films from the 80s, showing enormous progress in aesthetics, graphic technique and understanding of lab processes. (Most of his work now is in 35mm, and often in CinemaScope, an unusual format for this kind of animation.) Since 1999’s Get Happy, it seems, Woloshen has found his rhythm and his method. And happily, following the huge festival success of Ditty Dot Comma (2001) and a subsequent retrospective at the 2002 Ottawa International Animation Festival, his work has been increasingly seen and recognized at festivals, cinematheques and other venues around the world. His film, Cameras Take Five, was included in the Animation Show of Shows. Woloshen has self-published a book on his tecniques of camera-less animation: Recipes for reconstruction, with a DVD including nine of his short films.